Soluble Humate Powder SP-85 or SP-90 from Organic Approach is a great way to add important nutrients to fertilize your soil. Humus is the organic matter of soil - the high quality carbon that makes up a vital part of healthy soil and is necessary for germination and healthy plant, tree and turf growth. Humates are the retention component of soil, helping to keep nutrients (fertilizers) and water in close proximity to plant, tree and turf roots and helping to reduce environmentally harmful run-off. Our natural humate products contain a guaranteed 85% to 90% humic acids. Humates also act a pre-biotic, that is that they help to feed and maintain healthy soil biology. Larger Applications: Use Soluble Humate Powder at a general rate of 1 to 2 pounds per acre for crops or turf, 2 to 3 times per year. Smaller Applications: Use Soluble Humate Powder at a rate of 1.5 teaspoons (tsp.) per gallon of water. For best results, apply during the cool part of the day or when temperatures are below 85°F. Do not spray just before or after rainfall or sprinkler irrigation. Use a mild rate of a surfactant / sticking / wetting agent for maximum dispersal and leaf adherence. Made from pure oxidized lignite (Leonardite). 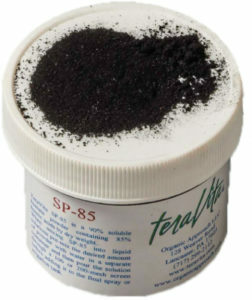 SP-85 humates contains a guaranteed 85% humic acid and is at least 90% soluble in water. SP-90 humates contains a guaranteed 90% humic acid and is at least 98% soluble in water.